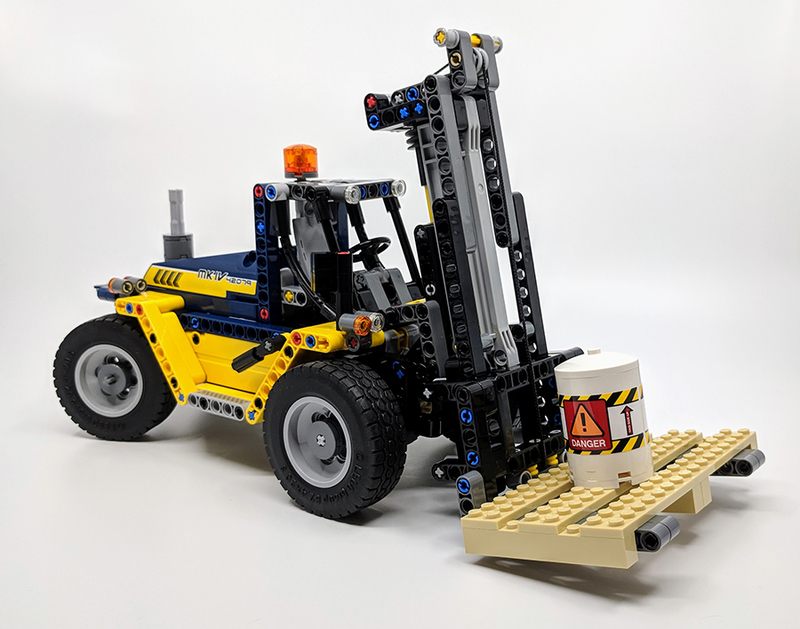 For the next of our reviews of the new LEGO® Technic™ summer releases, I’m taking a look at the smallest of the new sets, 42079: Heavy Duty Forklift. Construction machines make up a big part of the Technic line. Their instantly recognisable look and ability to allow for various functional actions, make them a decent fit for the theme. 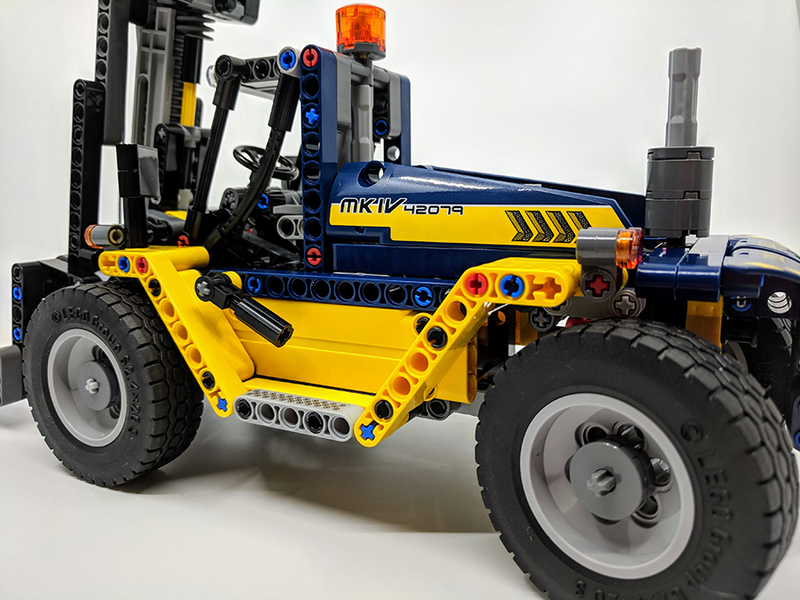 Just like LEGO system sets, new pieces can allow for new takes on vehicles, which have been done numerous tikes before. 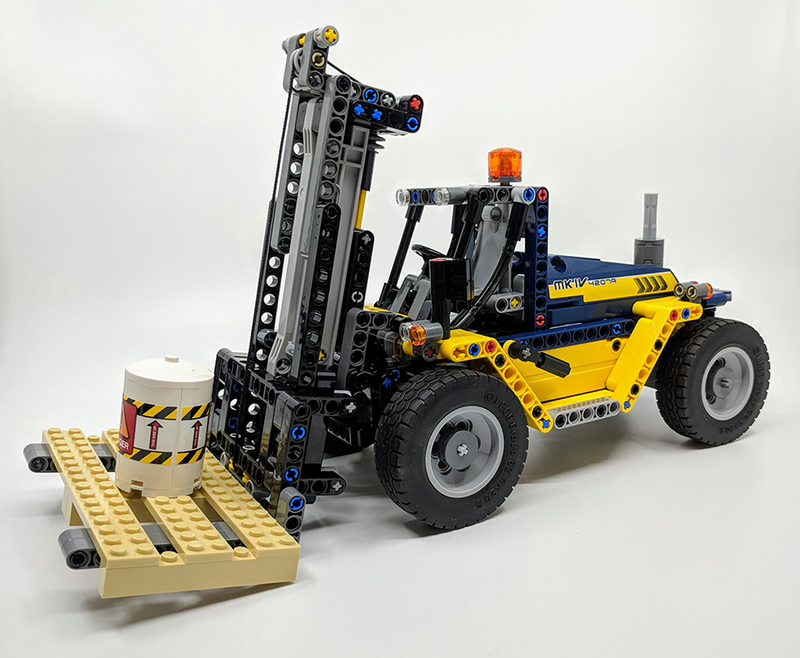 In fact over the years there have been around 16 Technic forklifts, in various guises. The set may not have the pumptastic power of the Forest Machine or the futuristic flair of the Volvo Concept Wheel Loader, but how does it shape up? Let’s find out. 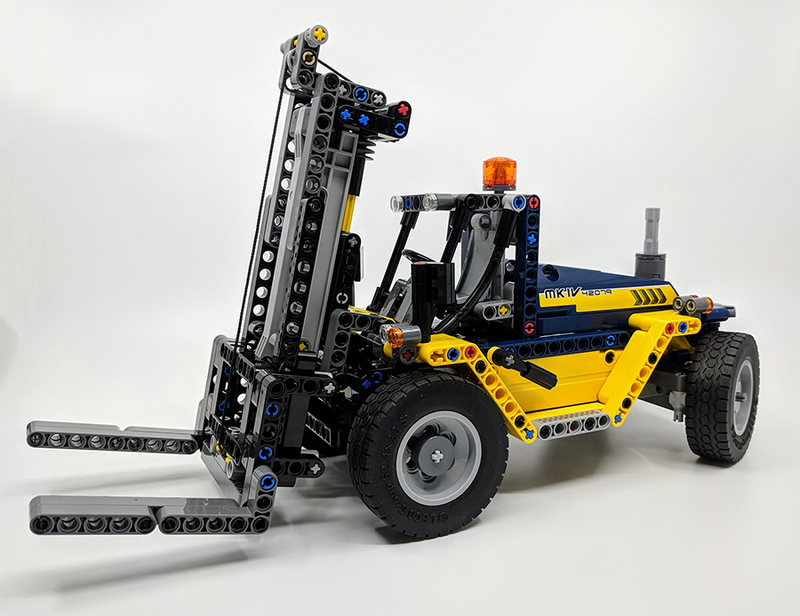 After building both the Forest Machine and the Volvo Concept sets in the last few weeks, plus I’m still putting the finishing touches to the enormous Rough Terrain Crane, I’m pretty much in the Technic frame of mind when it comes to building. 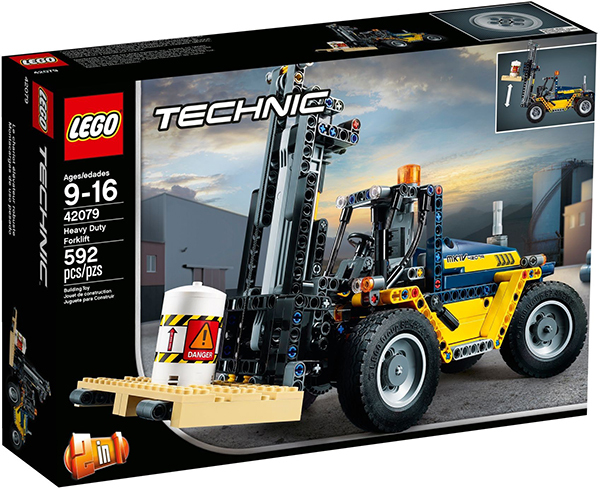 For many LEGO system fans, the thought of tackling a Technic set, may not appeal too highly. But they are a unique experience, especially seeing how complex systems are combined to create working functions. But those complicated gears and dials can be as overwhelming as they can impressive. Which makes this set the perfect entry point to the Technic system. 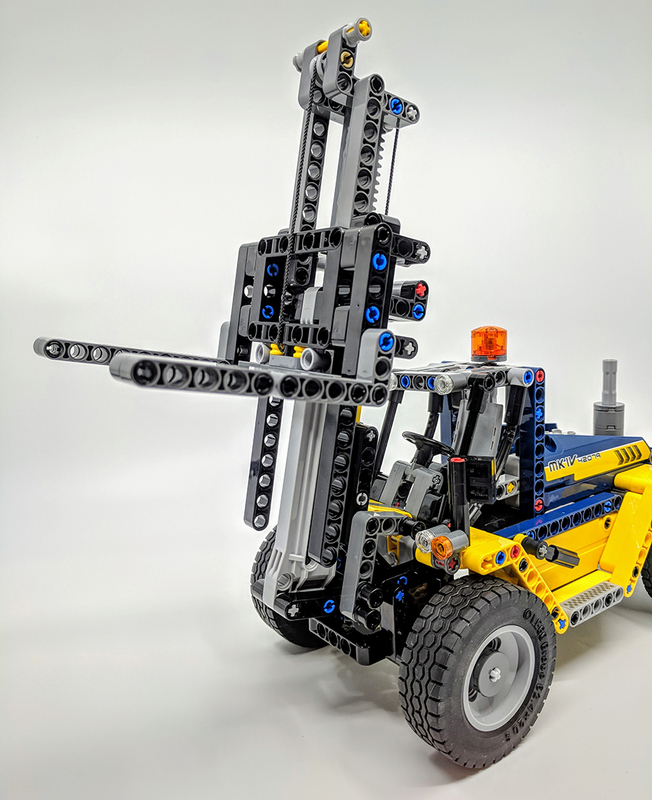 The build has enough of the uniqueness of a LEGO Technic set to give you the experience of the system, without bombarding you masses of rod, pins and dials. As the set is a mid-sized one, it will also keep you building for a while, but not for hours or days like some of the bigger sets can. 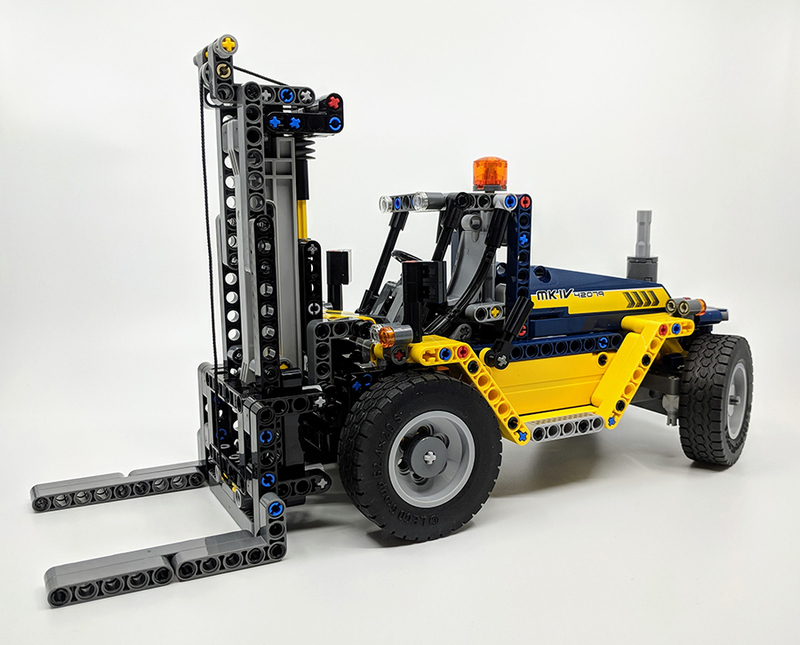 The build begins with the inners of the forklift, this does include a very basic gear system, which powers the piston engine, steering system and parts of the forklift. Much of the functional ability of the set in built into the fork arm, this is built independently to the main body of the vehicle and is focused around the new racket piece. This is made of two pieces, which connect by slipping the ‘teeth’ racket gear bar into the new grey racket housing. Combine them with a couple of gears and cotton thread, results in a working lift. Along with the main set, you also get a pallet and barrel, both made from LEGO pieces. 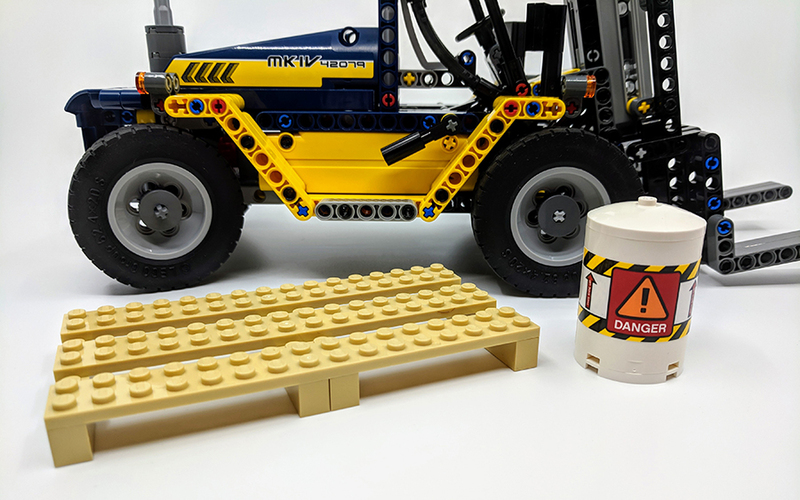 The pallet can be lifted by the forks and thanks to the tan coloured LEGO elements, it looks exactly like a wooden pallet. I’d of liked it if there was also a couple of 2×16 plates on the underside of the pallet has well, to offer that true pallet experience. A couple of rounded wall elements and circular plates make the perfect sized barrel of dangerous liquid to lift up and down. Much of the detail of the set, is achieved with stickers. These are found on the barrel piece, on the rear of the forklift and the wing mirrors. 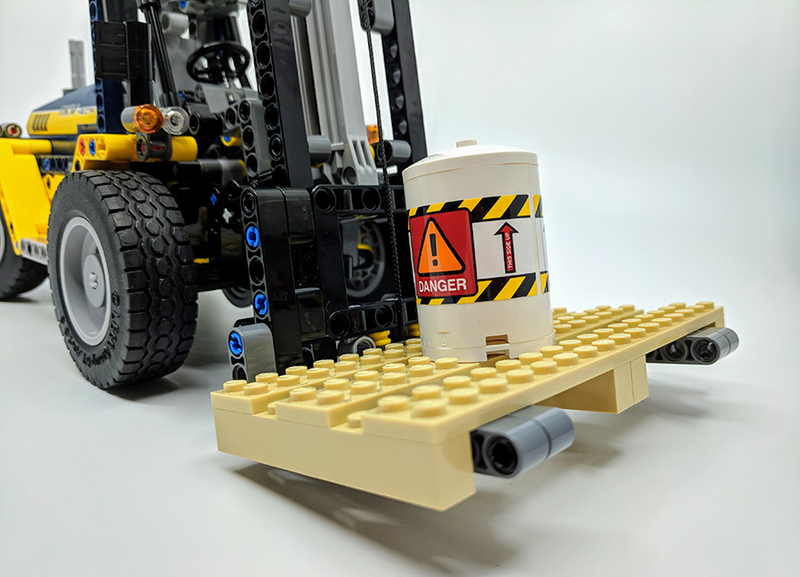 Thankfully much of the Technic elements used on the outside of vehicles are plates so stickers are easy to apply. 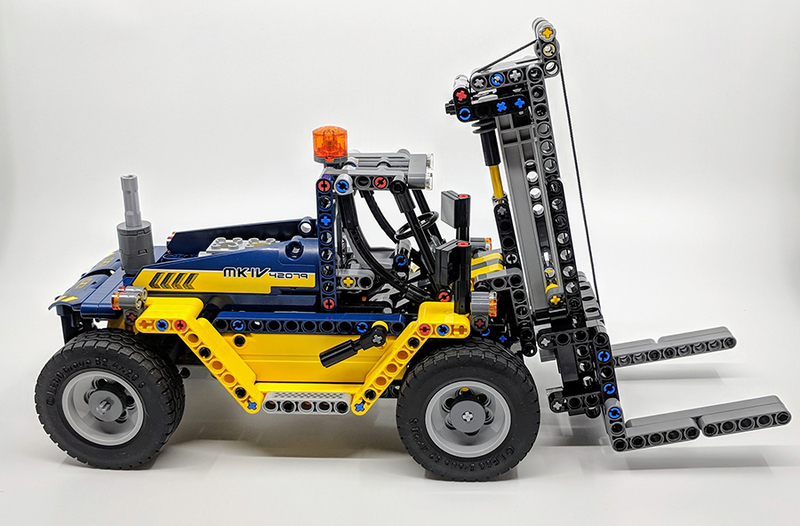 The colour scheme of yellow and blue is also quite nice, some of the previous Technic forklifts have gone with the traditional yellow or gone totally left field with reds and greens. This is a nice mix of both. 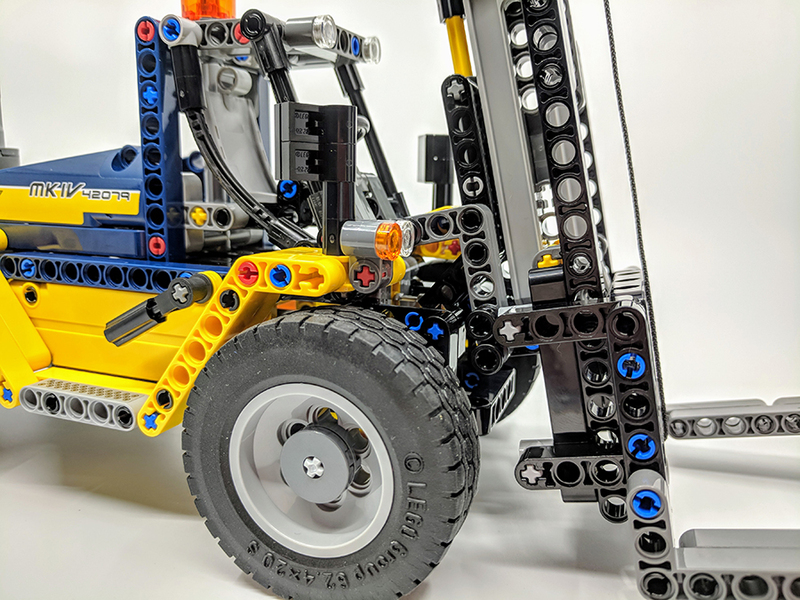 Almost all LEGO Technic sets have the ability to be built into two different models. 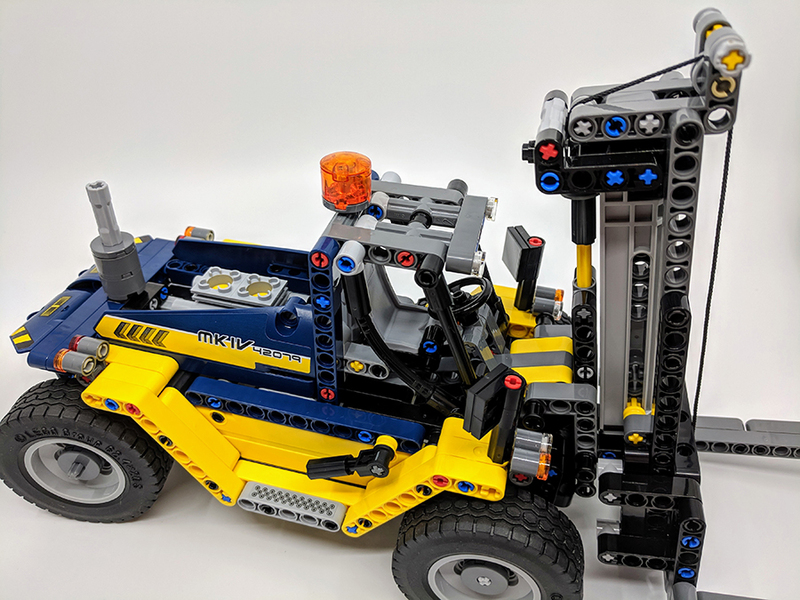 Set 42079 can be also be built into a Tow Truck. 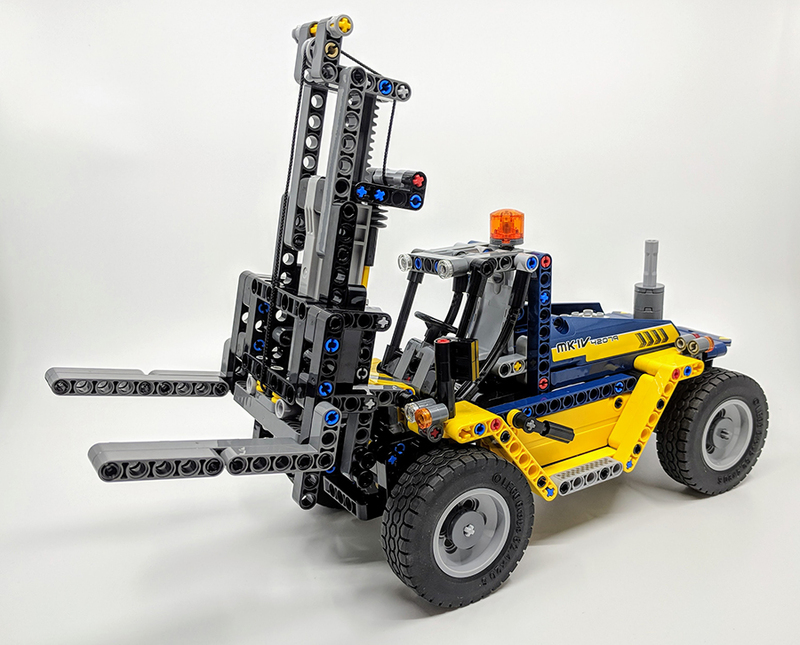 The same elements are used and the forklift functions translates into the tow truck tow arm. 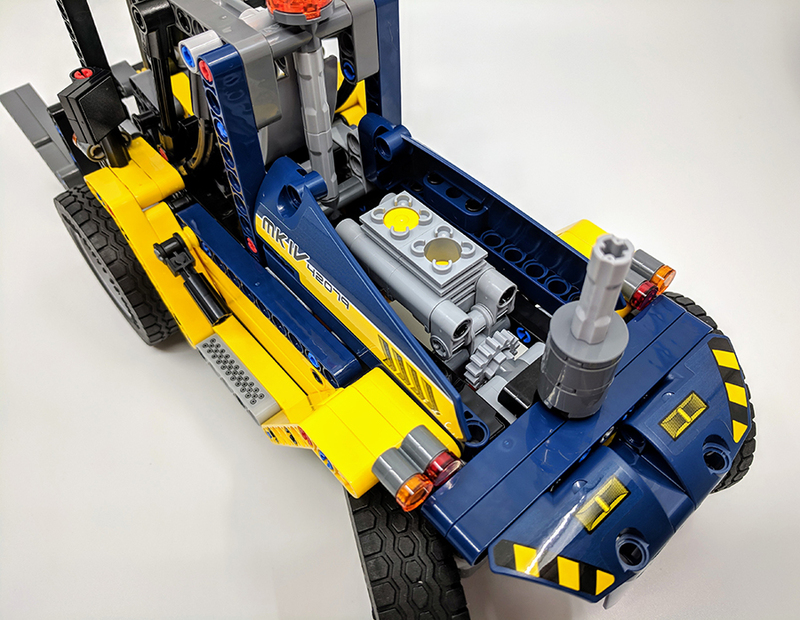 Unlike most Technic sets, the box includes instructions for builds, making it a little easier to build either version of the set, without having to use the digital versions online. There might not be a battery in sight, but the Heavy Duty Forklift still has a couple of functional features. A steerable rear axis, which is controlled via the exhaust funnel at the rear of vehicle and a working lift. This is controlled by the safety light sitting atop the cab and a lever to the side of the cab. Turning the light, reels a cotton thread, which is used to lift and lower the forks. 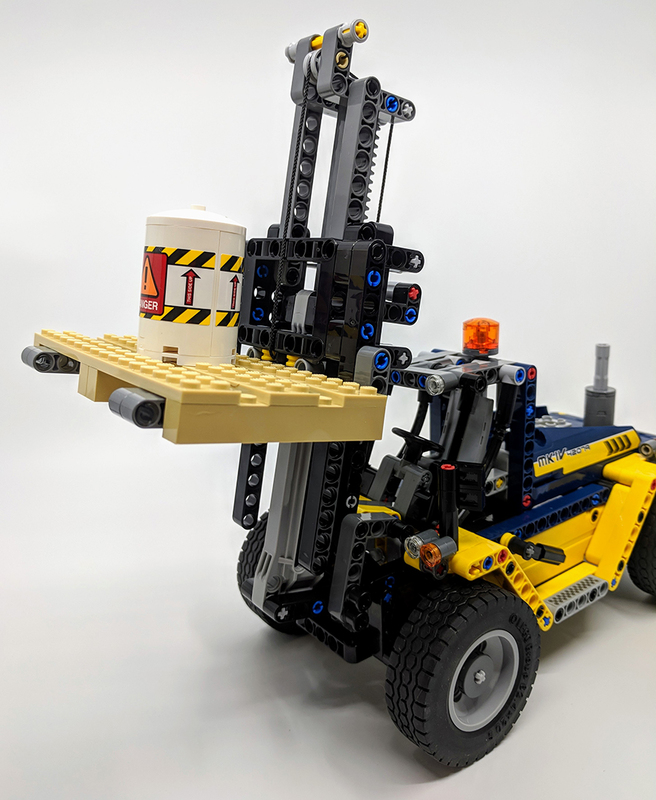 Thanks to a clever combination of the new racket elements and wheel hubs, the motion of the lift is surprisingly stable. 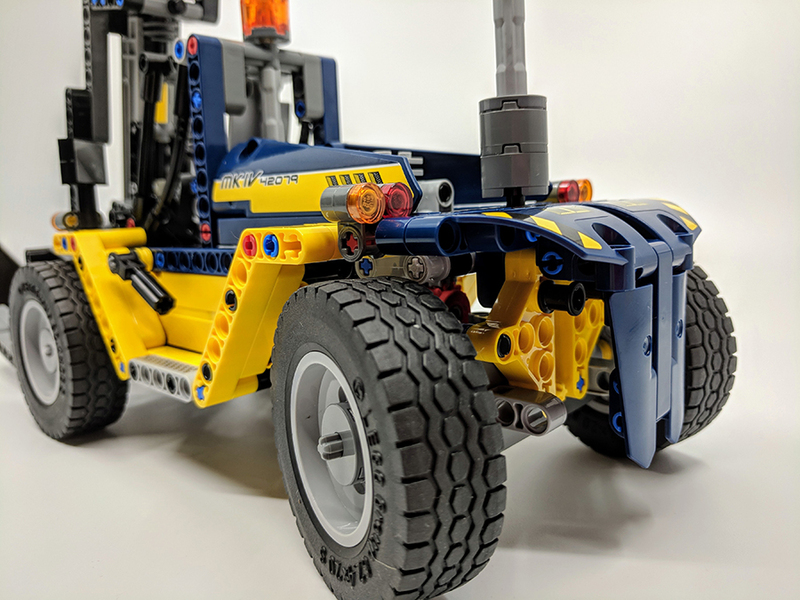 The levers either side of the cab are used to tilt the entire lift arm, both motions match that of the real world vehicle. They also make lifting the included pallet a breeze. Although it lacks the fun of powered play, it’s still a nifty little bit of LEGO engineering. Along with the manual functions, the forklift also has a minimal bit of automation in the twin cylinder engine. This uses the motor cylinder elements, found in many Technic sets, along with the yellow pistons elements. These move when the forklift is pushed along. 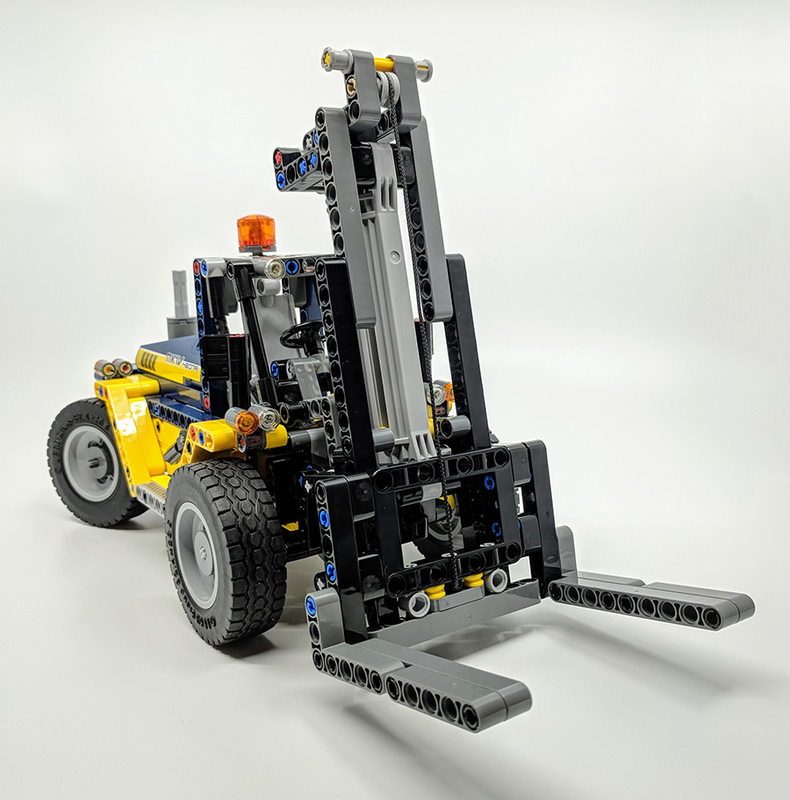 The Heavy Duty Forklift is the perfect introduction to the LEGO Technic range. The set includes a degree of ‘engineering’ but it’s not a overly complex build. There’s not intricate gear system, which would definitely overwhelm first time Technic builders. 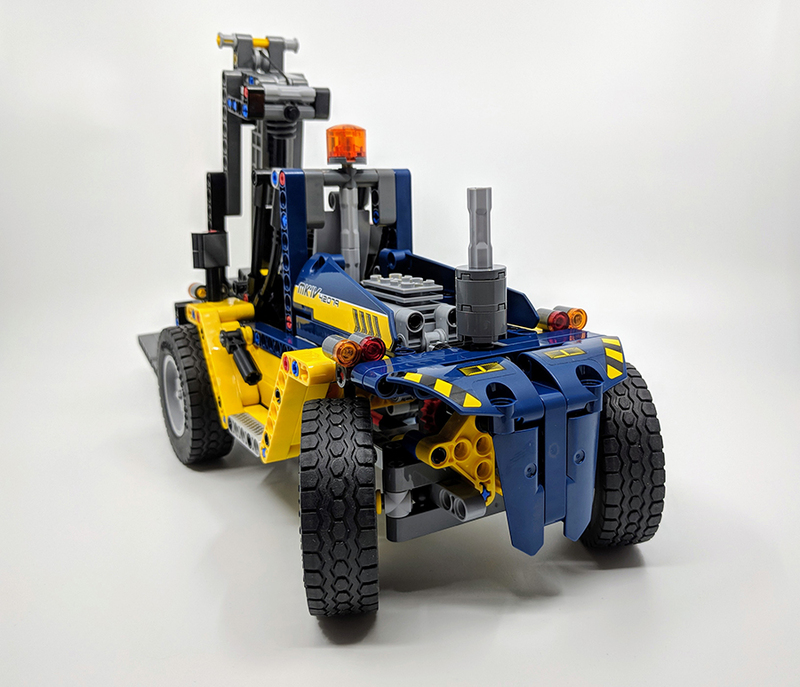 Yet there is still a enough of the build to offer the unique Technic experience. I love how the controls are hidden with the visual details of the set, which does make it just seem like a bog standard set with no play features. Yet there they are hidden in plain sight. It’s great two have instructions included in the box offering an even wider experience of a Technic build, without having to go in search of the instructions online. 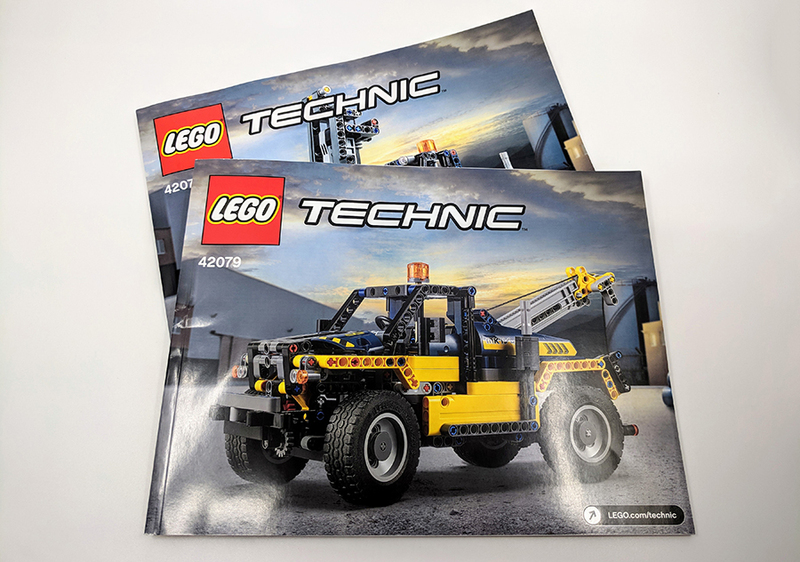 Although they are easy to find on the official LEGO Technic website. This set was provided via The LEGO Group for the purposes of review. The thoughts and opinions of the set reflect those of BricksFanz and not that of the LEGO Group.